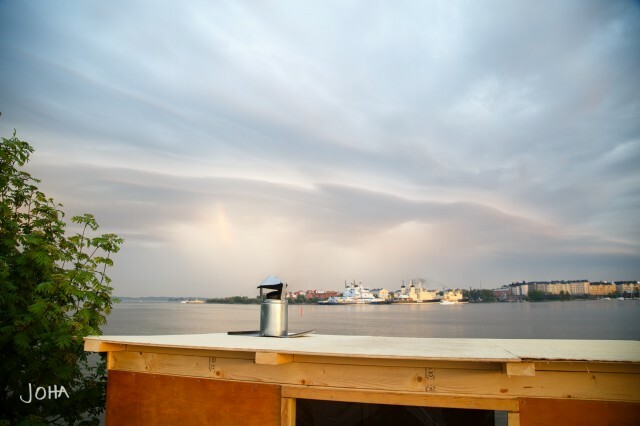 Sompasauna is a wood-burning self-service public sauna, built and maintained by a group of volunteers in Helsinki. Visitors enjoy the sauna and swim in the sea at their own risk; there is no lifeguard or staff on-site. The sauna is open around the clock and free for everyone to use. Sompasauna is located in Sompasaari Helsinki, a 15 minute walk from the Kalasatama metro station. Check out the Google map at the bottom of the page. Visitors bring their own towel (swimsuit optional) and sauna beverages. An open-fire grill is also available to cook sausages. Firewood is usually available on site but, in winter, it’s advisable to buy a small bag of firewood from a 24h gas station or supermarket. Throwing water on the stove is allowed. In winter, it’s advisable to buy a canister of spring water from a 24h gas station or supermarket. Ask Finns for tips on how to enjoy sauna – they will gladly help you. Please remember to keep the sauna neat and tidy. Clean up after yourself and take your trash with you.